Iran's constant threats towards its Arab rivals across the Persian Gulf are spurring their move towards a diplomatic and military union. The proposed union was formally put on the six-member GCC's agenda by Saudi King Abdullah Bin Abdul Aziz Al Saud in December. An advisory summit that began in Riyahd on Monday was the anticipated date that a union between Bahrain, Kuwait, Qatar, and Saudi Arabia would be announced. Oman and the United Arab Emirates were expected to join at a later date. However, the summit said that more time was needed to study the details further to ensure a smooth transition for all countries. The council of foreign ministers will look into the report prepared by an ad-hoc committee of 18 members, three from each of the six member states. The council will submit its recommendations to an extraordinary summit to be hosted by Riyadh, Saudi foreign minister Saud Al Faisal said at a press conference Wednesday. He did not give a specific date. Of particuliar concern to the six Sunni monarchies that form the GCC is maintaining relative autonomy in domestic affairs. Nonetheless, the desire for a union to serve as a strategic bulwark against Iran's drive for hegemony over the Persian Gulf remains high. “People understand that more time is needed for such a crucial development,” political analyst Jaber Mohammad told Gulf News. “The union may take time, but it will happen." "Those who support it will wait for some time, but they will press for it in cases of unexplained delays,” he said. On Monday, Iran’s Majlis Speaker Ali Larijani said that Bahrain was not a bite to be swallowed easily and that the plan to unify Bahrain and Saudi Arabia would result in negative effects and consequences. “If Bahrain is to be integrated into another country, it must be Iran and not Saudi Arabia,” Larijani said, Irna news agency reported. However, Bahraini MPs rejected the Iranian statements and sharply condemned Iran’s parliament and officials. “The Iranian majlis has wronged Bahrain and the other GCC countries,” MP Abdullah Bin Huwail said on state run television. “Tehran does not care about the feelings of the Gulf citizens and is exporting threats to the GCC states." "We tell them that such threats strengthen our resolve and determination to go ahead with the union because it spells further prosperity," he added. Shaikh Khalid Bin Ali Al Khalifa, Bahrain's justice and Islamic minister, said threats were often issued by the weak. He has previously said Iran views his nation as a jewel to be taken for its crown. “The people in the GCC countries support the orientation towards the Gulf union,” he said. Experts said that the Gulf union would make the GCC countries a powerful economic bloc with a GDP exceeding $1.4 trillion and a single market strength of 42 million people, with 65 per cent of them under the age of 30. In Saudi Arabia, the largest of the GCC states, the media reported King Abdullah clearly wanted all member states to join the union together - not just two or three states as a beginning. 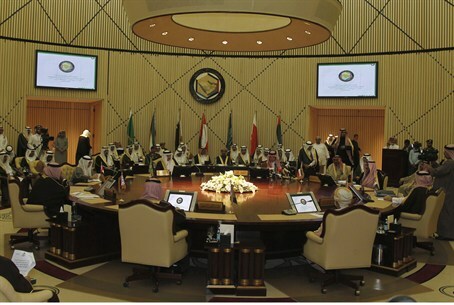 The London-based Arabic daily Al Sharq Al Awsat argued that a GCC union was not an option, but an existential necessity. The daily said a Gulf union would have a military force of 360,000 members. The six Sunni Arab monarchies of the GCC have repeatedly accused Shiite Persian Iran of seeking to destabilize their regimes by stirring up unrest in their local Shiite communities. They have also sought to expand the union – eyeing fellow Arab monarchies Jordan and Morocco, as well as populous Egypt – as prospective members. Prince Saud Al Faisal has said on three previous occasions that, should Iran obtain nuclear weapons, Riyadh will seek them as well.